Today I read that the new CEO Shumate laid off key personnel at Houston Public Radio KUHF. The Front Row interviewed our duo twice – the first time in 2007, our first performance in Houston; the second in 2010, almost exactly 3 years ago. It was a novel experience to go on radio, not just to be interviewed but to play on radio. To play meant playing on a magnificent concert grand — a Steinway — in the radio’s recording studio. I wish we had taken photos of ourselves in the studio. This was before smartphones. It was before we knew how to behave on radio. At least we blogged about it. Listening to the radio clips reminds me there’s more work to be done. We have recorded Summer and Winter of Vivaldi’s Four Seasons, and then our lives got hugely interrupted. We need to do Spring and Autumn. When will that be? There are many interesting stories surrounding the compositions and even more that we could relate to regarding our re-discovery and revival of these compositions for our two instruments. Reading the latest news about KUHF’s layoffs distresses me. Bob Stevenson, who had interviewed us, has been laid off. Couldn’t the CEO’s salary be halved and save a few positions? 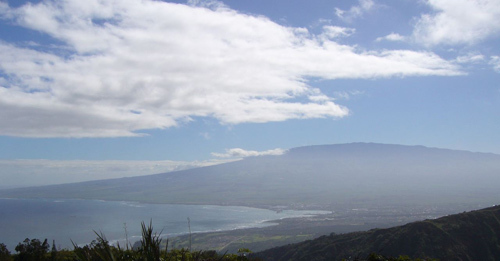 Here on Maui, I almost exclusively listen to the Hawaii Public Radio in my car. I tell my music literature students to give up what they usually listen to and, at least for the current semester, listen only to public radio. It’s a good way to absorb classical music by immersing yourself in it. What do we do now? Download the mp3 clips and save them before everything disappears! 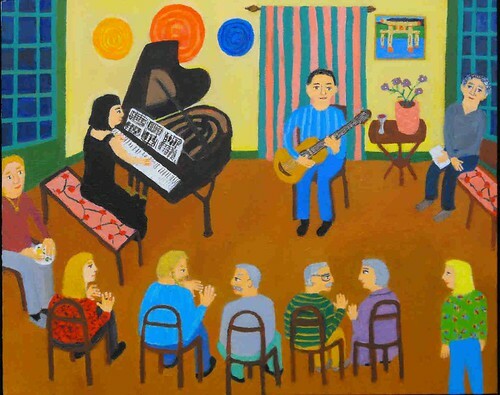 A painting of our piano guitar duo live in concert in Connecticut! What a delight to see us captured in a painting while we were playing on 23rd October 2010 in Connecticut! We documented our travels of Autumn in New England in a five part-blog starting here. In part 5, we remembered our concert at Mark and Beverly’s home. What fond memories we have!! Thank you, Ms Rosebrooks! Hope to meet you in person one day — and see your painting! Definition of piano orchestra = many players on many pianos making orchestral sound, a rare event. What do you do with 22 students in a classroom of just 15 electric pianos (2 of which do not sound) and one portable synthesizer for 3 hours? Let them take turns at the piano, one at a time. Give a lecture to the rest of the class. Swap. Put two students on each keyboard and have them play duets. Put two students on each keyboard and conduct them like an orchestra. When I googled “piano orchestra” I found a variety of piano concertos and questions about the role of piano in the orchestra. Truth is, it is rare to see so many pianos in one room, unless they are all for sale, in which case you can’t play on them as you wish. On day one, I asked my students to play just the black keys. I split them into several section. One section played successive quarter notes. Another joined with half notes. The third joined with whole notes. I then improvised on high treble. My father used to play Chinese songs just on black keys. Pentatonic music (using just the 5 notes of the 5 black keys) blend well in any order in any octave. Now is my chance to deconstruct my favourite works, be they classical concertos or pop songs. Assign the parts to the various pianists. This way, everyone gets to play. Doubling up is fine. The string section does it all the time. Most students of piano learn to play solo piano works. They advance to become soloists. Some learn to accompany choir or other instruments or voice. Others move on to become organists. Whether you’re an accompanist or organist, you serve the choir or congregation. You’re not equal. But when you play in an orchestra, ensemble, or chamber music group, it’s totally different. String players know this. Wind players, too. Brass players. Singers in choirs. But pianists in a piano orchestra? That’s nearly unheard of. 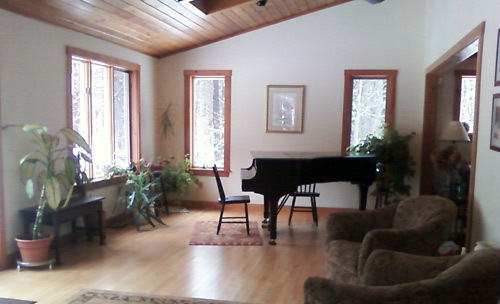 It’s hard to find pianos you can play in one place. It’s hard to move pianos into one place. It’s hard to find pieces written for many pianos. But ah! such joy to play together! The full polyphonic sound of a piano orchestra! 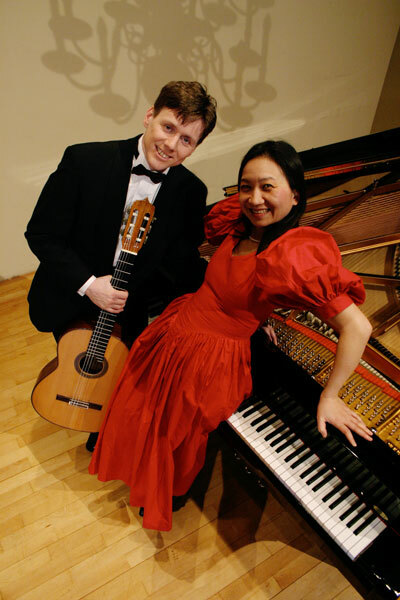 Classical guitarist Robert Bekkers will travel from Maui to Maine to meet pianist and composer Greg Hall, famous for his live concerts in Second Life where he is known as Tip Corbett. Reservations are requested and required for this rare opportunity to see two musicians perform original works for solo and duo of works written and not yet written, reviving that 19th century tradition of house concerts in Europe. They will be signing new CDs. An extraordinary event is set to happen on Sunday 13th February 2011 at 7 pm in Wells, Maine. Classical guitarist Robert Bekkers will travel from the sunny tropical island of Maui in Hawaii, crossing an ocean and most of the North American continent to the snow-covered town of Wells, Maine. There, he will give a concert with a pianist he has yet to meet — Greg Hall. Pianist Greg Hall, also known as Gregory Hall, is a composer, pianist, and improviser. 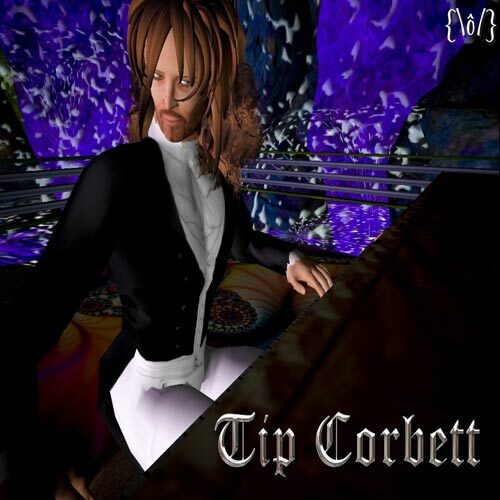 He gives regular weekly live concerts in “Second Life” where he is known as Tip Corbett. Below is his avatar. Pianist Greg Hall, a.k.a. Tip Corbett in "Second Life"
On Sunday 13th February 2011, Greg Hall will appear in real life as himself. Where is Wells, Maine? Robert Bekkers will take the 1.5 hour train ride from Boston going north. It will be an adventure in New England, now covered with snow. What a change in weather it will be for Robert Bekkers who has been exploring Maui since Thanksgiving Day 2010 when he ended his coast-to-coast concert tour of mainland USA. Together, Greg Hall and Robert Bekkers will revive that 19th century tradition of cozy house concerts when musicians played music they wrote (compositions) or music not yet written (improvisation). Back then, musicians were both performers and composers. Bekkers has arranged a number of pieces for piano and guitar, performed and recorded but not yet published though highly sought-after. Hall’s repertoire can be heard online in “Second Life” as well as from his website. 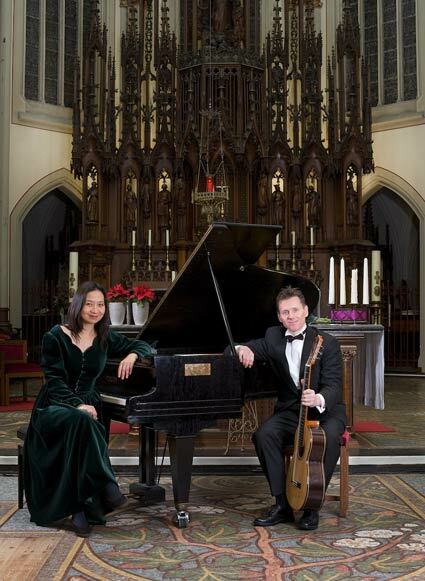 They will play two sets solo — and join the two sets with duo improvisation and sightreading. It is probably the first of its kind. Bekkers’ solos will be extracted from his “Cappricho” programme (2 page PDF): virtuosic works of Villa-Lobos, Brrios-Mangore, Brouwer, Bach, Walton, Martin, and Castelnuovo-Tedesco. Both Hall and Bekkers will be signing their solo and duo CDs during the intermission and after the concert when guests are encouraged to stay and chat. Bekkers is currently producing CDs of live recordings of two concerts of his own piano guitar duo. For more information, visit Gregory Hall concert announcements, Bekkers Piano Guitar Duo concert agenda, or download the one-page PDF. A percentage of the proceeds will go towards the selected charities of the late owners of this house: Animal Welfare Society of West Kennebunk and Maine Children’s Cancer Program, in memory of Dennis and Nella Hudon. At first, I split up a quatre-main (4-hands, one piano) duet into separate parts for a single guitar and piano. Then I noticed that the piano duet left out many wonderful melodies. To do Carmen justice, I opened the orchestra score, found those beloved themes and allocated them as I saw fit. What shall I call my arrangement? How about Carmen Potpourri for piano and guitar? I borrowed the Dover edition of the orchestral version for Bizet’s Carmen opera months ago. The full score looked intimidating, a reminder of the arduous score reading exercises I had to do during my years at conservatory. And so the hard-back book laid on my piano unopened until I found free sheet music of piano solo and duet transcriptions on the Internet. Eureka! I found a short cut. It is possible to reduce orchestral music to piano and fewer instruments. It requires a lot more imagination the other way around. At first, I split up a quatre-main (4-hands, one piano) duet into separate parts for a single guitar and piano. Then I noticed that the piano duet left out many wonderful melodies. To do Carmen justice, I opened the orchestra score, found those beloved themes and allocated them as I saw fit. Dutch guitarist Robert Bekkers stopped me when he saw that I was giving the exciting parts to the piano. It reminded me of my own protests when he had given himself the interesting, virtuoso passages in his arrangements of Bach’s Badinerie, Chopin’s Piano Concerto in E minor, Vivaldi’s Four Seasons, and the Handel’s Arrival of the Queen of Sheba for our duo. Now that’s a challenge — to play the fast notes completely in sync with each other! We do that quite a bit in Vivaldi’s Summer from his Four Seasons. I can have the guitar play exactly what I play in the same register or an octave apart. Or we can play a third apart. “Give me big powerful chords,” he said. He wants to show off, but so do I. We’ll just have to take turns, I decided. Bizet’s opera was set in Seville, Spain where we had visited in April 2009 for a gypsy flamenco project. I remember the flamenco rhythms and the percussive nature of such exotic music. Arranging Carmen brought back memories of that week as well as my visit to the Netherlands Opera production of Carmen at the end of the Holland Festival in Amsterdam. Technically speaking, the piano and the guitar can replace 16 single-note instruments: 10 fingers on the piano plus 6 strings of the guitar. If we add our feet and elbows, then we can do even more. I love sound of the guitar being used as a percussive instrument. Can I do the same on the piano? Or would I need drumsticks? What shall I call my arrangement? There are numerous Carmen Suites and Carmen Fantasies on Naxos CD Online and youtube. Mine is not a suite or a fantasy. A suite is structured — mine is a medley of various sticky tunes, and yet it’s more than a medley. A fantasy would require a lot more imagination, dedication, and virtuosity. I want it to be fun and interesting, not like some of the 19th century arrangements of popular opera themes for guitar and piano. How about Carmen Potpourri for piano and guitar? Coincidentally when I google “Carmen Potpourri” I find our piano guitar duo website and this blog. Maybe that’s what it should be called: Carmen Potpourri for piano and guitar. We are now preparing a completely new programme for 2010. What sets it apart from previous programmes is that it is full of new transcriptions that are equally fun and exciting for piano and guitar. We open with Handel’s Arrival of the Queen of Sheba. We are now preparing a completely new programme for 2010, to debut on 21st January 2010 in Doorn, Netherlands. What sets it apart from previous programmes is that it is full of new transcriptions that are equally fun and exciting for piano and guitar. We open with Handel’s Arrival of the Queen of Sheba, whose 4-hand one piano score could easily be read for our piano and guitar combination. While I was visiting Helsinki in mid-November to play the duet with my Finnish friend, Robert Bekkers transcribed it for our duo. It’s a piece that makes me happy every time I play it. The choice for the second piece is tricky. I’m not sure what to put between the Queen of Sheba and the third piece: Winter from Vivaldi’s Four Seasons. Perhaps we should choose a lesser known piece, just to break the familiarity of sticky tunes, or as the composer and pianist Daniel Abrams suggested, a solo piano or guitar piece. Robert arranged Winter for our duo, largely because the Summer concerto worked so well for us. The latter was very exciting and challenging to play in sync. He chose it after spotting a young Korean guitarist playing the fast sections on youtube. Originally written for string orchestra, Winter is much easier to play than Summer. I particularly like the second movement – Largo. 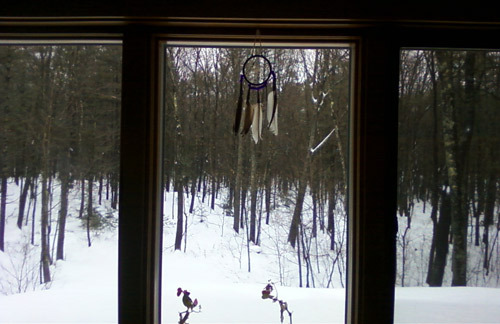 How fitting it is to study Winter in the final week of 2009 with snow thawing on the ground. I feel that sweet contentment of being indoors, in the warmth and coziness of a well-insulated Dutch house. Winter has never been like this, where I grew up — in the subtropics. I first heard Manuel de Falla’s Danse Espagnole from the opera La Vida Breve at a final exam concert at the Utrecht Conservatory in 2008. I was so taken by it that I invited the Spanish violinist Angel Sanchez Marote and the Okinawan pianist Shumpei Tanahara to play it again in our Monument House Concert Series. [A midsummer afternoon tea concert programme PDF] I asked Angel (pronounced An – hul) where to get the music. He said it was one of many popular arrangements by Fritz Kreisler, available at music book stores. Coincidentally, Robert owned an arrangement for two guitars which he rehearsed with his own duo. His guitar part was 80% the same as the violin part in the violin-piano score I found at a second-hand sheet music store in Amsterdam. Needless to say, it was a matter of time before we adjusted the score for our piano guitar duo. I was delighted to stumble upon a video clip of Angel playing the Spanish Dance, with a different pianist (below). The only works in our new programme that are original to piano and guitar are the Grand Duo Concertant and Grand Potpourri National which are long enough to fit a concert by themselves. The former was a collaboration between 33 year old Mauro Giuliani and 19 year old Ignaz Moscheles, and the latter between Giuliani and Johann Nepomuk Hummel. The 25-minute Grand Potpourri National is a joy to play. It contains themes of national anthems of the countries in 1815 when it was written. So far we’ve only managed to identify Rule Britannia and Haydn’s Deutschland Uber Alles which became the Austrian national anthem. We’re told there is also Vive Henri IV (French national anthem). What about the others? When I met the English guitarist and composer David Harvey in London in 2006, he gave me his arrangement of Piazzolla’s Tango Suite no. 2 (from his guitar duos). It’s only now that we have time to include it in our repertoire. We played it recently for my Rotary Club gathering. We revisit another great Spanish maestro, the blind composer Joaquin Rodrigo (1901-1999), whose Fantasia para un Gentilhombre took us through all of 2009. This time, we return to his most famous guitar concerto, if not THE most famous of all guitar concertos: the Aranjuez. 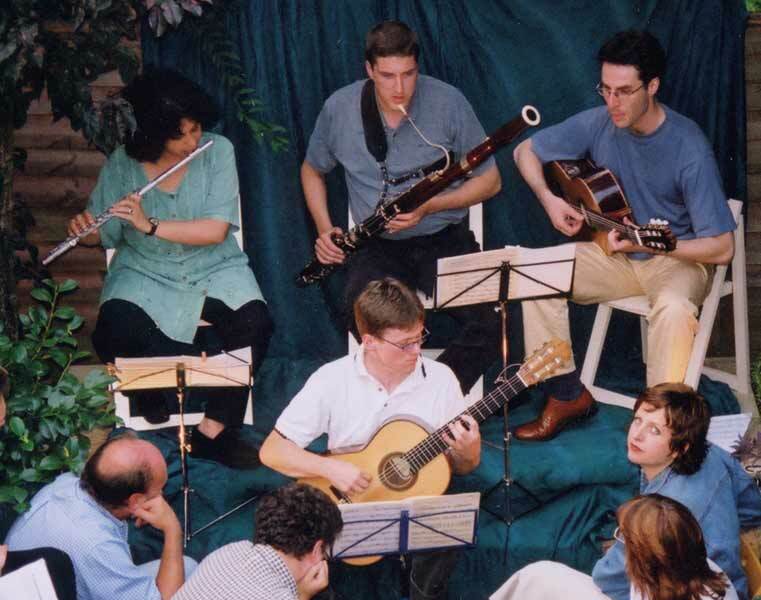 Robert had arranged the beautiful slow movement for himself as soloist with an ensemble of flute, bassoon, and guitar in an outdoor summer concert which I organised in London (photo below). Since 2002, we’ve considered studying all three movements of the Concierto de Aranjuez, we’ve never been so convinced until now to include it in our program. Ever since I saw Bizet’s Carmen in Amsterdam, I promised and vowed to make an arrangement of my favourite pieces from this delightful opera. The orchestral score has been sitting on my grand piano for months while I searched for interesting piano solo and duet arrangements. Perhaps my own arrangement for piano and guitar will be the missing second piece in our new programme. That’s my way of getting back into the swing of composing again.